Taking the ‘Coughing Major’ as his starting point, Graham’s entertaining new play becomes a playful dissection of trial by populism, the nature of truth and reality, and the slow encroachment of video cameras into all aspects of public life – British courts being one of the few places left in our society where video cameras and photography are actively excluded. lost in the upscale. Interactive voting and pub quiz elements feel like filler in the West End space, and similarly, a pre-show warm up, which is common for game show audiences, falls a little flat in the four-tiered theatre. game shows, soaps, and big power ballads. Literally, there are sections in which the action stops for a bit of bad karaoke or thirty seconds of old soap characters arguing about an alleged affair. This kaleidoscopic take on culture is relevant to the themes of the play – what do we ask quiz questions about if not our own culture? – but these asides sometimes feel like a desperate attempt to keep the audience engaged at any cost. Graham should have more faith in the emotional capacity of his characters. The most effective moment of the night is unspoken, and interrogates what emotionally repressed men struggle to say to each other. It truly shows what Graham is capable of in terms of staging crisis and emotion, and is far more engaging for the long-form structure of a play than the theatrical equivalent of meme culture. 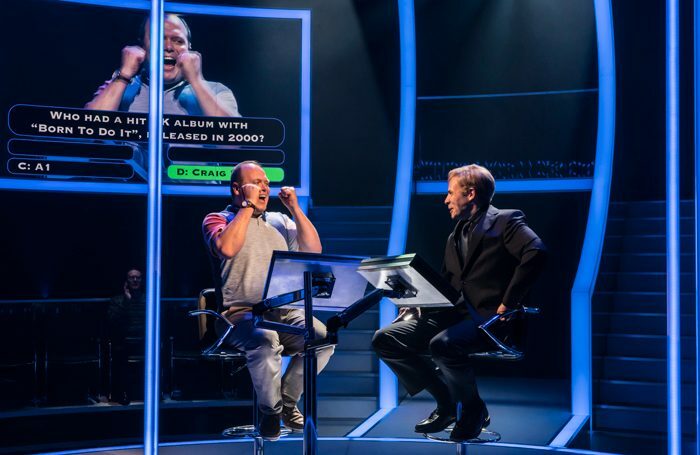 Elsewhere, Tim Lutkin’s lighting design and sound design by Ben & Max Ringham really nail the quiz show’s aesthetic. Keir Charles does a wonderful Chris Tarrant impression, and with the help of several camera close-ups his twitching facial features provide the biggest laughs of the night. It does not even concern me that this feels like an ‘impression’ of the troubled star; it is thoroughly entertaining character acting and helps to probe the real/unreal dichotomy that Quiz returns to, intertwining how we remember the original show with a warped live stage version of it. What is reality? And is there such a thing as a single narrative truth? When the play does explicitly mention Trump, the sound of a nail being predictably struck on its head is deafening. At its strongest, Quiz is a smart and emotionally tender take on our ugly hybrid of reality television and mainstream political justice; the false democratisation of culture which has its roots in ‘calls cost £1 per minute plus your standard network rate’. It is the very dangerous idea that we all have a vote if we can afford it. At its weakest, lights and cameras do not make up for a lack of action. Quiz runs through 16 June.